Our daughters’ lives are not fairy tales with prewritten, happy endings. The threat against each of them is real, and the ending of the story is yet to be decided. In fact, the challenge is so great it will take a hero to save the day. A hero called…father. It is never too early for a father to create a plan to mentor, protect, guide, and love his daughter. It is never too late for a dad with an older daughter to reestablish relationship with her. Chockfull of effective tools and contagious hope, this empowering book helps parents work together to guide the girls they love on the path to maturity. Brian and Kathleen Molitor are the founders of the Malachi Global Foundation, an organization that equips men to guide and bless the next generation. 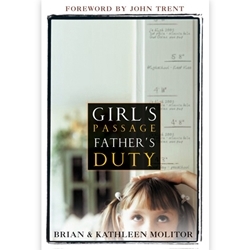 Brian's book Boy's Passage—Man's Journey helped launch this ministry into many nations. Married for more than twenty-three years, Brian and Kathy are the parents of four children.